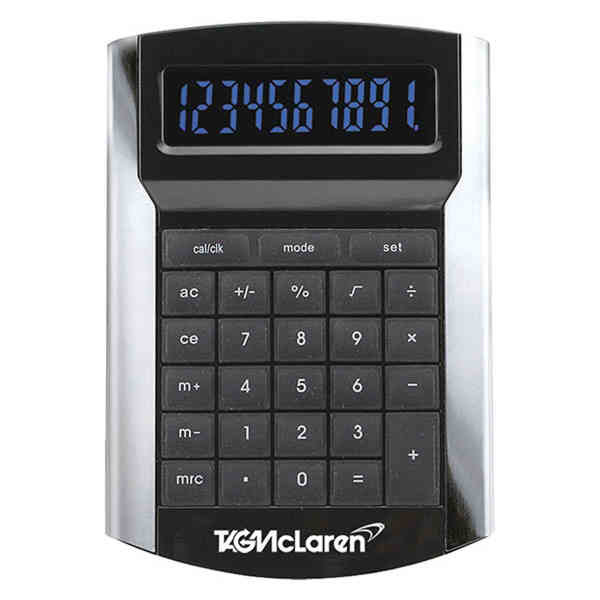 Imprint Method: Pad Print - Increase the reach of your brand with a knockout item like this desktop calculator! It features an alarm clock, countdown timer, and a calendar and displays all of the information on a large, digital luminescent blue backlight screen. This illuminated display makes it suitable for nighttime use! The stylish metal accents give this a high-quality look and three AAA batteries are included for immediate use. Pad print this with your company name or logo and make this available for schools and offices everywhere! Taiwan. Size: 5 1/2 " x 3 7/8 " x 1 "